“Hi, A friend lent me her Rido R2 to try out last week when we were on holiday on our tandem trike and I mentioned to her that I was suffering from saddle soreness. I was most impressed. It took precisely three miles to get used to, was wonderfully comfortable and I ordered one for my solo on my return home on Monday. Received it today – excellent delivery, thank you. Just been for a 24 mile test ride with the R2 saddle on my solo bike which included a serious hill. I hoped I would find the R2 as comfortable as I had on the tandem trike. After the first mile or two I did not give the saddle another thought, which to me is always the proof of how good an item is! Comfort at last! Will be ordering again – possibly two more (one for the tandem and one for the tandem trike). “I love the Rido saddle. I sit straighter and my weight is taken by my seat bones so there is less pressure on my soft tissues. It has taken a long time to find the right saddle. My husband had one first, then I got one too. They seem to be good for both sexes. “I have the R2 on my commute bike and the racier one (RLt) on my racer (I don’t race though) and am more than happy with both. Have spent the last week out riding on our amazing bike paths here in Napier NZ. After quite a few years of intermittent biking due a lot to such uncomfortable saddles, have had no ‘sore bits’. The husband hasn’t either. A few minor adjustments to both the new seat, and to handle bars ( due to the different seating position), and oh boy! What a difference. We are both purely recreational riders, in our mid sixties and will never be going huge distances. BUT! Now we could in comfort if we chose to do so. “I love my Rido saddle, best ever. I have ridden for years with stupid soft gel type saddles. This Is the best. I am a leisure rider. I use canal towpaths but don’t mind a bit of distance. Since getting this saddle I no longer have any saddle sore problems. “I am getting along very well with my R2. One of my colleagues plans to buy one on my recommendation. 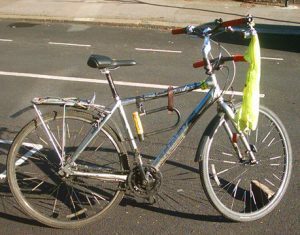 I’ve attached a couple of snaps of my bike; it is my going to work bike which entails going over Highgate Hill (400 ft) in both directions every day, about 35 miles per week. I got a Rido R2 because at 60 I have a bit of benign prostatic hyperplasia and somebody on a website recommended your saddle; and it has proved an excellent buy. My Trek has two sets of bars, one for high vis in traffic and one for speed and fluorescent streamers to get cars to give me a bit more room, both work really well even if they are a bit nerdy. It also has a 7 speed Nexus hub and a 3 speed Shimano front changer so it really is a bit of a DIY machine, and while it does the job, it might not be the Flagship machine for you guys! “I recently cycled in a group of 25 people from Lands End to John O’Groats over 14 days and some 1004 miles. Bikes ranged from carbon racers to hybrids and included my 20 year old steel framed Raleigh tourer. Despite everyone training for the ride, the rigours of 14 consecutive days in the saddle meant that by the time we crossed the border into Scotland everyone was experiencing various degrees of saddle soreness with Sudocream being used by all. But when I say “everyone” and “all”, that actually applied to 24 of the 25. I was the odd one out because I had bought one of your saddles last year in preparation for the trip. I can honestly say that it was the best cycling purchase I have ever made and in 14 days of strenuous cycling my saddle remained supremely comfortable throughout. 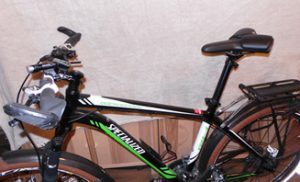 “I recently purchased a RIDO R2 saddle to put on my Giant Anthem X29. I have been riding regularly for about 2 years and this is my fifth saddle. I ride mostly paved bike trails with the occasional crushed rock trail or cross-country excursion; usually about 25 miles (2 hours or so) at a time. The bike is full suspension with a standard seat post. I run the 2.10 X 29 tires at 70 psi on the paved trails and 40 psi on crushed rock or grass/dirt. The bike won’t be used at anywhere near its full potential, but I needed the suspension for my 67 year-old musculo-skelatal system Besides, I like nice hardware. “The prep is there, I’m flying tomorrow so its all very real! 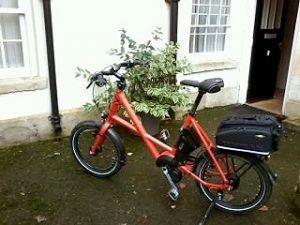 “I had the Rido fitted to my new Kalkhoff Compact Urban electric bike from day one. The saddle arrived in good time for me to take with me to 50Cycles in Loughborough when I collected the bike. It had its first outing on a cycling weekend in Scotland and its done quite a few miles since, even though I was away for most of December and I am pretty much a fair weather cyclist. The Rido is superb and after spending a whole day cycling there was no discomfort. Other saddles costing a lot more I tried on different bikes have left me in agony so it was money well spent and it looks great on my orange Kalkhoff too!